← Rhyl’s first motor car. Letter from America 7 and a remarkable coincidence. It’s a small world, the old adage goes, and increasingly so thanks to the power of the internet. Maggi Blythin is sharing family letters with us that were written home from America. A lady in Chicago is researching Welsh gravestones in the cemetery. Thanks to the internet they have met and shared their information. Some weeks ago I was contacted by a lady from Chicago. She originated from North Wales, but had lived in America for many years and is now the President of the Cambrian Benevolent Society. 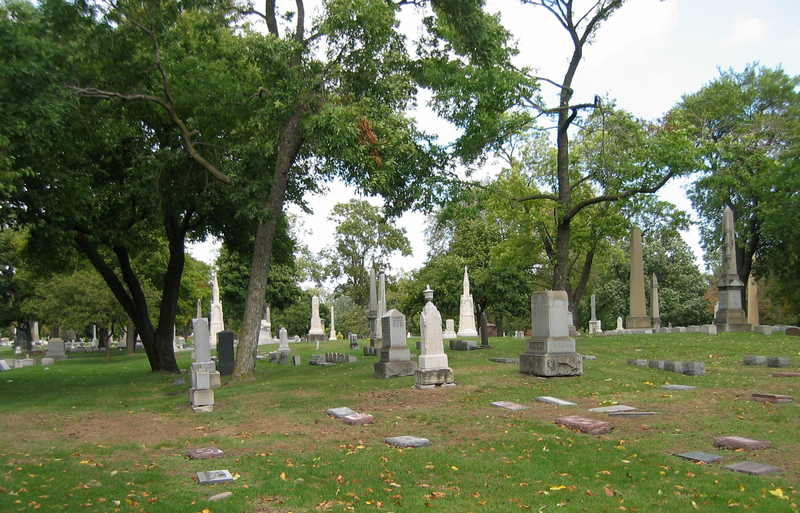 She is in the process of writing a book about the Welsh immigrants in Chicago and, as part of her research, had visited the Graceland Cemetery where many Welsh people are buried. 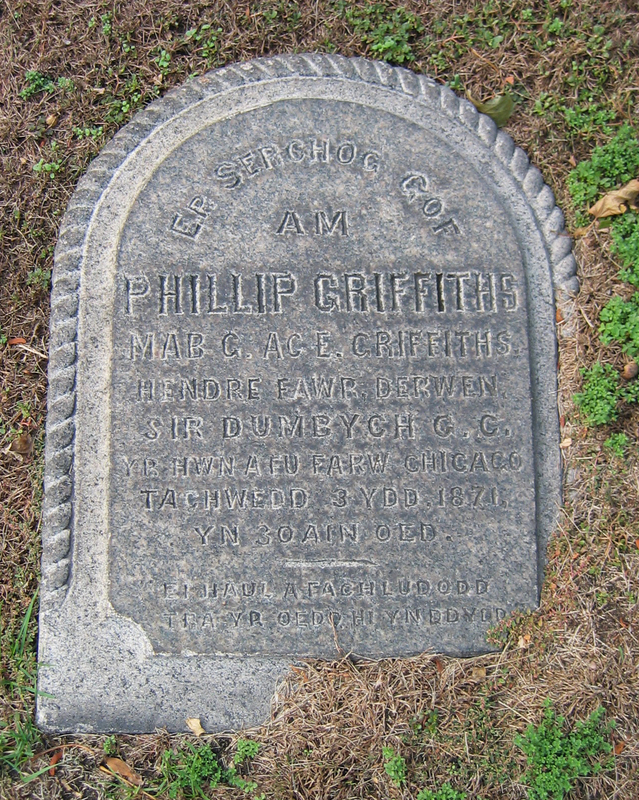 She took photographs of several headstones amongst which were the ones of Thomas Jones, Cefn Mawr, Denbighshire and Phillip Griffiths, Hendre Mawr, Denbighshire. When she came over for a visit she went to Ruthin Archives and found copies of the letters written by Phillip and Edward Griffiths. She was delighted with this find and on the off chance “googled” their address, 213, Mitchell Street, Chicago which took her to the Rhyl History Club website and then to me. I was amazed to see her photos of the headstones, they were buried next to each other, and she was very pleased to be able to use a photo of Edward Griffiths that I had. A small world !! This letter (the 7th) is written by Edward after Philip’s death. Written from 213, Mitchell Street, Chicago on November 6th 1871. I have the sad task of informing you that our dear brother Philip has left this life at 8 o’clock on Friday night, November 3. I wish you not to feel sad because I think that he and Thomas Jones are better off than any of us. He did not get much better since he came from the South. Something affected the constitution of Thomas Jones and him until it was impossible to get better. The two died of the same sickness, that is typhoid fever. I hope you will have the strength to hold on in the face of your bereavement. We know what bereavement is and we must be content that God has taken him. I think it is wicked for us to be discontented. Our great concern should be to be prepared because we don’t know the minute that we shall be called. In the funeral the Minister said that the only difference between us all was that he had reached the end of his journey and that we are all on our journey and as sure to reach the end of it as he has done. Wherever we may end our journey in this world, let us all wish to meet in the next. I think he had every attention one could give. Two of the best doctors in town attended him, Dr MacMichael and Dr Davies-a Welshman. Dr Davies is considered one of the best doctors in town. When he first saw him he said he had little hope for him. Philip was taken ill on Friday, a fortnight to the day he died. He went home from work about 3 o’clock. He had the ague and a heavy fever after it. He was very ill on Friday night but on Saturday he felt quite well. On the Sunday he had the ague and fever as before. He felt better on Tuesday. He went to work until dinnertime, but as he felt unwell he went home. He complained of his chest and stomach. He felt fairly well the rest of the week until Saturday night. When I came home on Saturday night he was in bed feeling very ill. I asked him to come to supper or would he like a cup of tea. I went to fetch one. He talked quite nicely but complained that his head was feverish. John asked him if he would like us to fetch the doctor. He said he would not until the morning. He expected to be better Sunday morning, but he felt very feverish. I went to fetch the doctor, I was advised to go to the best doctor, Dr MacMichael. He came here after lunch. He gave him some medicine and told him that if he took it he would get better quickly. I attended him as best I could and the people of this house were doing their best in every respect. When I am ill I wish to be here or in Hendre Fawr. On Monday I stayed home to attend to him. He was vomiting a lot. I went to the doctor in the afternoon and I had a lot of powder from him. On Tuesday morning he felt better. . . . . . .
the rest of the letter was lost, but is written by Edward.